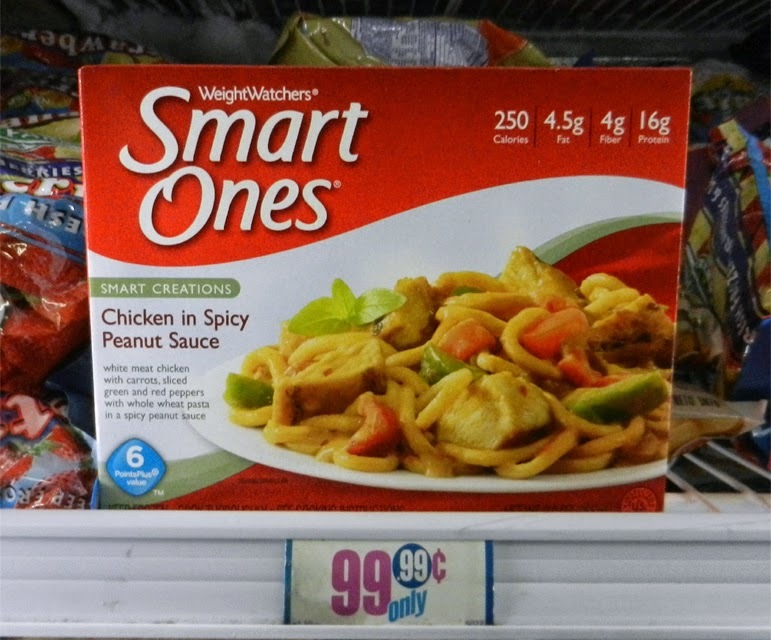 When Weight Watchers Chicken in Spicy Peanut Sauce meal says spicy....they mean it! Whew, the first bite of this microwaved Deal of the Day has a kick, but in a good way. Although, I bet that is why this meal ended up in the bargain deli case at my local 99c only Store. The spicy sauce is the focus - it's very sweet with a peanut butter flavor, which helps tackle the fiery peppers. I think it's too sugary, but I'm sensitive to overly sweetened food. The sauce is like gravy and there is plenty of it. Red and green peppers and thick-sliced carrot taste fresh frozen, and not too overcooked, plus the pieces are larger than typical TV dinner fare. 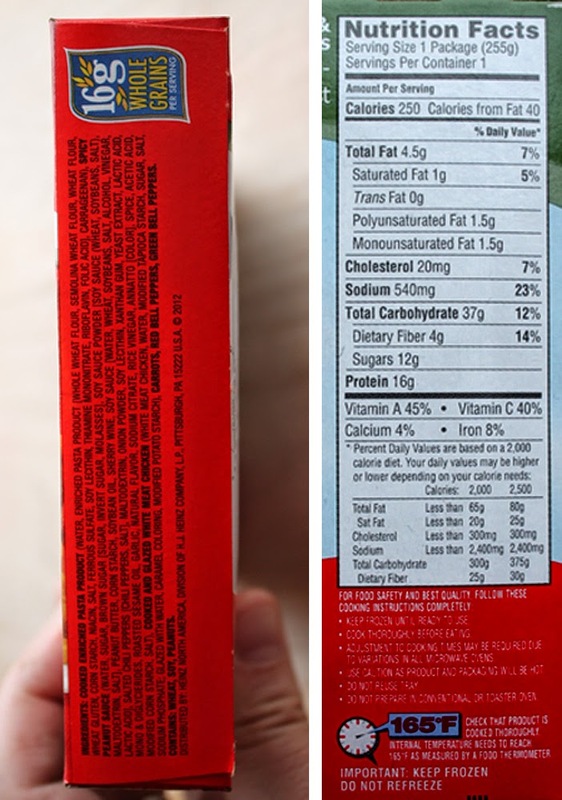 The whole wheat noodles are fatter than cheap packaged ramen and have a good flavor; I think Weight Watchers is going for Japanese buckwheat soba or udon noodles. They don't quite reach that level, it's more like spaghetti, but I give them credit for trying. 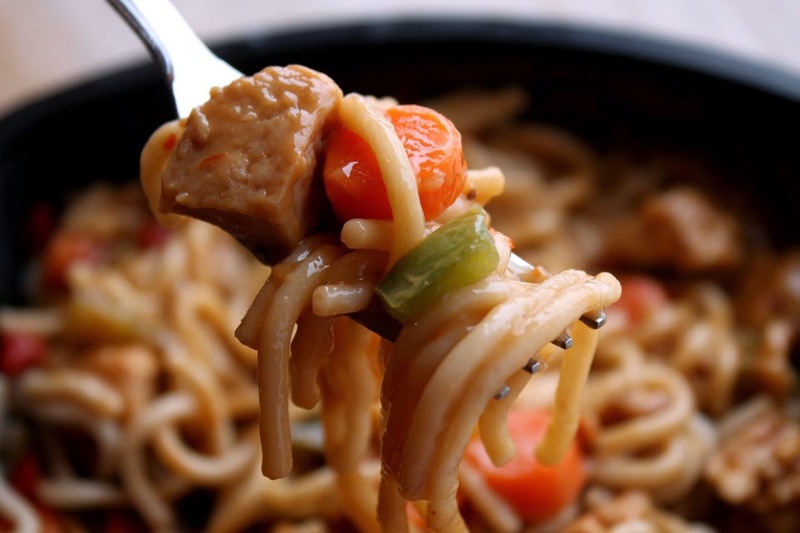 It's tricky microwaving pasta noodles, as they are so easy to overcook into mush. These noodles retain a little firmness - I would have preferred a bit more chewiness, but that could be due to the duration of my microwaving and steaming. Real white meat chicken is used and you get a lot. The pieces are large and tender. 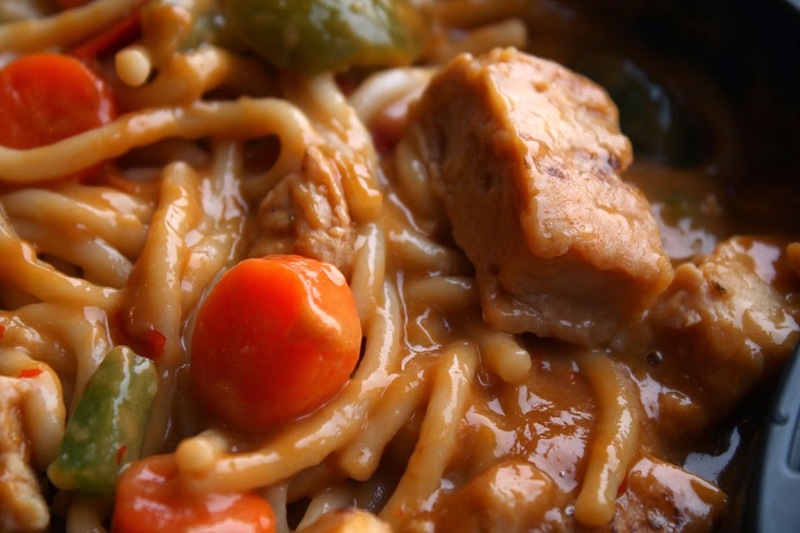 White meat can be bland, but it absorbed the tasty flavor of the peanut sauce. So, on The 99 Cent Chef's Cheap$kate Dining Scale of 1 to 9, 9 being best, this Deal of the Day has all the ingredients for a perfect 9 -- but the balance is not quite right. The sauce is just a little too spicy and sweet. So Weight Watchers Chicken in Spicy Peanut Sauce still gets a solid 7 ! It's a decent deal for 99.99 cents, and I will pick up more for my office lunches, if they aren't all snapped up the next time I hit my local 99c only Store. I like to keep a couple of these low cal. heat 'n eat type foods in the freezer, so that on the days I'm hungry but nothing sounds good, I can pull one out. If I'm hungry and nothing sounds good I will eat and eat, consuming way too many calories. 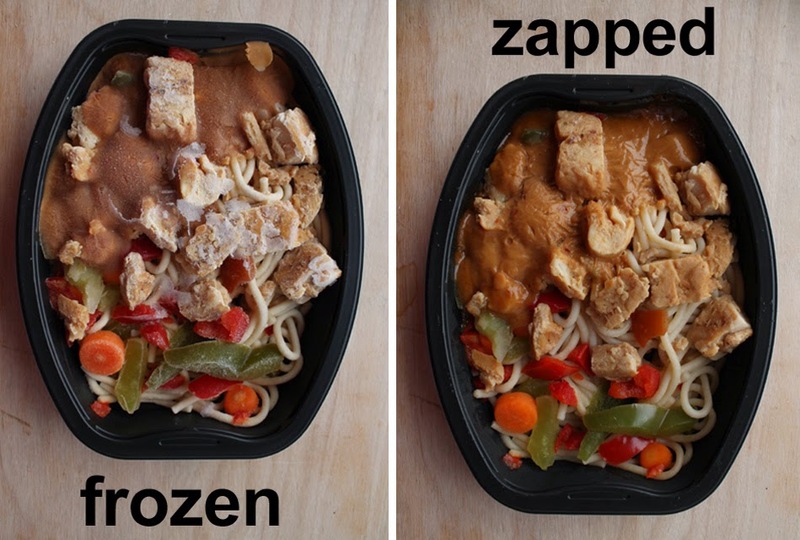 These frozen entrees are a real life saver. If I'm extra hungry I'll add some veggies or salad on the side. I'll have to give this one a try since I like Thai style and it has a good amount of white chicken in it. Thanks 99cent Chef!